Cuisine Kathleen: Getting on My Plaid a tude! The table setting and the teddy are adorable. I need to be on the lookout for some tartan. I love your whimsical and well-thought-out tablescape! Now this is a plaid I could live with - the pink one! What a pretty take on an Easter table and mixin' the plaid in too. Your centerpiece is really fun. Love those kinds of finds. Your little tartan guy with the bunny ears made me laugh! You are sooooo much fun! I love all things plaid! That little bear is so cute, but the pastel tartan tablescape makes me swoon! Hope you have a great (and warm) week! Wonderful post. Happy Pink Saturday and Tartans. Love the Tartan bear in bunny ears and those egg/frogs are great. Kind fond of the smaller one for some reason. Is that because I saw that one first? Was the precursor to .99 stores a Benjamen Franklin? Woolworth's? Or Sprouse-Reitz? Loved thinking about those. You have some great finds and they just went together so very well. Neat. Neat. LOVE it all! BUT again I am EYEING those cupcakes! ARE THOSE from Christmas Tree Shop too??? and I LOVE LOVE LOVE those little bunny salts! UGH! I am going to HAVE TO GO THERE one of these days! I went to the grocery store today and an Elderly Gent passed in front of my car WEARING THE ""BEST"" TARTAN HAT I've ever seen! I thought of GRABBING IT and running with it!hehe.........Hmmmm, maybe he would have SOLD IT TO ME! "I bet he wouldn't have! Yes, they are! But when I was there yesterday, they were all gone. They had something similar though. Get in your car and go! I giggled out loud when I saw the tartan bear in his bunny ears. You crack me up!!! Love the plaidatude here, Kathleen. Great job! I have to agree, tartan seems a bit more winter, but Tartan Day is in April. ;-) Thanks for joining the parade. Mr. Linky will be up at 1 AM Sunday morning. What a cute table. I don't have Tartan plaid but should! I do have some other plaid maybe I can find that? Love the napkins you made! Cute! I love pastel plaids! They make me happy! Love this! It's so soft. When did you get those mint plates??? I never saw those. And, I had eyed those egg centerpieces at V&B but never saw them as low as you did, so I never got them (and now they're gone - boo hoo!). Great way to work in the plaid! I think those were one of my first Dollar Tree purchases, so probably 5 years ago! I probably got the egg at VB in the dead of winter when the population drops. They just wanted to free up the space, I guess, cause it is a big box! 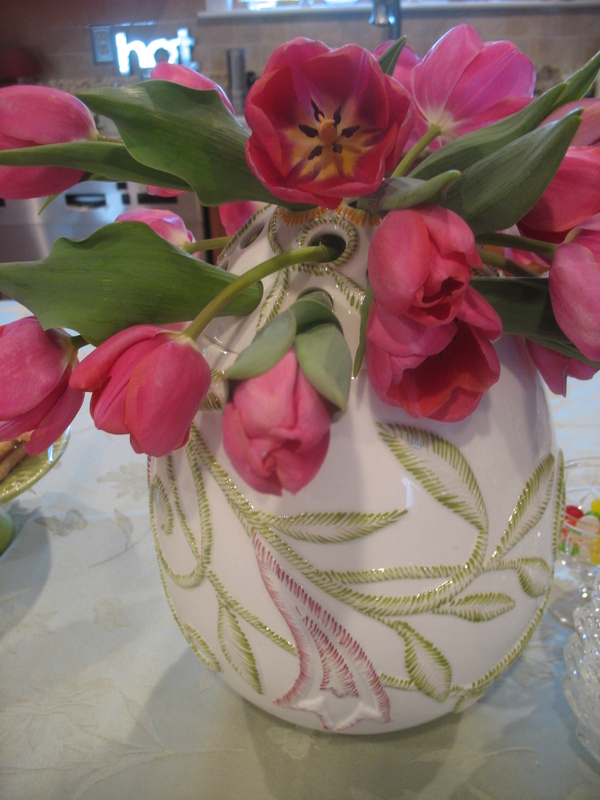 I love the tulip holder vase in your centerpiece, kathleen..very unique! This is so sweet! I love the cupcake covered bowls. Mr. Tartan Bear wearing his bunny ears just cracks me up! Great give away on your blog! Thanks for the heads up! Wow, I didn't even know that there was a National Tartan Day. I love the pink and green. You have so many beautiful treasures. I love the table. You are really clever when it comes to thinking up these tables. I just posted my third tablescape as my Easter table. I think it turned out very cute. You are such an inspiration to me. Hi! Love your table. Your plaid is very pretty. That is just the cutest of the cute for tables Kathleen! You have every cute Easter thing around plus you got it at a great price! I have been planning to link up, hope I can this week. Thanks for your note, you always cheer me up! You definitely got your plaid-i-tude going! Fun Easter table. Happy Spring! what a pretty table! no one sets a table like you! Love your pastel plaids Kathleen, you have the best ideas, this table is perfect for Easter. Love also hearing about the bargains you seem able to unearth whenever and wherever you are! Enjoy the Tartan Parade, we've got front row seats and a picnic! I love the colors you chose in your table-scape! Your bunny ears on the plaid bear cracked me up! Your Easter plaid tablescape is awesome. What a deal! Love your sweet napkins and all else you'll do with the left overs. Your table is just darling. Love the little cupcakes, oh, just everything! You are SO funny!!!! That poor bear is probably embarrassed to tears!!! I was with you...I went totally Spring with my plaid. I love tartans, but I just don't have a lot of it decor-wise. Next house, maybe! :-) You did a great job with this table, but I am still going to have to beat you up over so many references to CTS! We just don't have anything here in this area that even comes close to those kinds of bargain deals!!!!! Your tartan bear,,uh, bunny is a hoot!...and your tablescape is so 'pretty in plaid'. Just perfect for this time of year. Love your green flatware, too. CUTE post, and thanks for joining the Tartan Parade. I can never resist a pun so your title pulled me right in for this delightful post! Oh Kathleen, you alway set the most whimsy tables, along with such pretty dishes. I love the colors of the layers ofplates. I love tartan, but have none, will make a point to get something. Hope you had a blessed Palm Sunday. Very Pretty Tablescape!..It's interesting to see how other people uses the same items you have, for example, I was lucky enoughto get the same cupcake bowls ( I have a cupcake collection addiction) but I have them just sitting there on my kitchen's window ledge..you brought them up to a whole different level! love it! Happy Easter! You make napkins the same way I do. i also make my own pillow cases--so much cheaper than buying them. And fabric shower curtains also are cheaper for curtains than buying fabric by the yard. Anyway, I always enjoy your tablescapes when I visit! AND, I am doing a Texas BlueBonnet Tartan table...on the same post. I am hoping to do something for your party....not sure what. I love your pastel plaid tablescape and your tulip holders. I have never seen any like them. And the bunny ears on your bear was hilarious! The egg candles in their little shells are precious & the little potted egg place markers go great with them. I ♥♥♥ the pink stems by Gorham...I miss my Lenox Outlet. Boo-Hoo-Waaaaa! And 'no', I haven't done any baking yet & I thank you for reminding me that I need to at least make some of the Easter Bread with the sweet topping! Duh? How could I forget? Nobody is coming here...we're eating at DH's DD home for this holiday. *sigh* Mixed families are hard sometimes. p.s. I BOUGHT (gasp!) a nut roll Kolachi today. Horrors!!!! I just didn't feel up to making a ton of them to just give away. I'm in a slump, I think....maybe Spring Fever??? What a great post! Your table is gorgeous! Your table is so cute Kathleen. I adore the little cupcakes and all the pastel colors. The egg centerpiece with the tulips is quite unsual, which I love. Always nice seeing new to me things! It never ceases to amaze me how many wonderful tablescapes you put together at bargain prices. Thanks for sharing at my party this week.